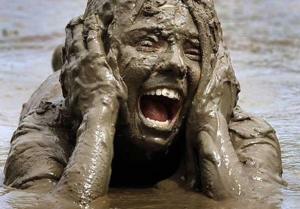 Organizing a mud run requires time for extensive planning, building and financing. Experienced organizers recommend that creating a successful event requires spending nine months to an entire year in preparation before the day of the actual race. Novice directors might consider initially organizing a smaller 5K or 3.1 mile event. Longer races require more planning time and expense. Form a committee to assist with the planning, organizing and orchestrating processes. 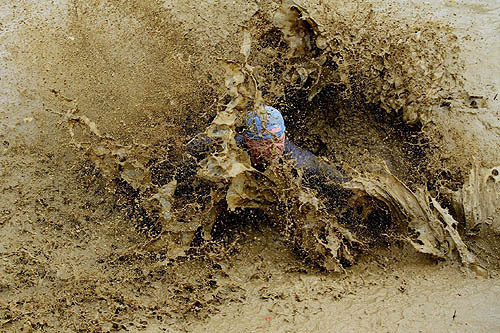 Since a mud run of this length typically includes anywhere from eight to 15 obstacles, event organizers must find a suitable outdoor location that has the possibility for creating the many challenges that often include mud and water. Whether acquiring a location on private or public property, determine the convenience or difficulty in accessing the site. Obtain the appropriate permits or permission. Construct the race on paper, inserting the types and locations of challenges along with site entrances/exits, registration areas, first-aid station and refreshment areas. Discuss each obstacle, decide on necessary construction supplies and designate building responsibilities. Determine awards for race winners or perhaps concession prizes for all participants. Choose a date for the event, taking care not to schedule the mud run on the same day or weekend as other community events. Devise a budget that includes any fees required for using the location, permits, liability insurance, equipment, building supplies, event advertisement and prizes. Establish entry fees. Popular, well organized events generally charge anywhere from $45 to $200 for each participant. Higher fees often accompany the chance to attend a post event BBQ or other food orientated affair. Unless having extremely generous volunteers who provide materials, time and products, event organizers must establish financial backing. Some may have resources to start the ball rolling, but the expenses involved typically require considerable funds. Initiate the sponsorship process by advertising the event. Explore MudRuns.net and establish a website which promotes the event and provides the option of registration, giving promoters an idea of attendance numbers. Print, post and hand-out flyers, advertise on local radio and television stations. Locate potential participants and sponsors by venturing out into the community, meeting with people and discussing the project. Visit local businesses, heath care providers, therapists and trainers who may donate money, time or products as complimentary gifts. Offer retailers and vendors the chance to set-up booths for free or a small fee. Up until the day of the race, the organizer and committee members devise the event, gather supplies, construct the course, coordinate with product and financial sponsors and formulate a plan that covers the entire race from beginning to the finish line. During the planning process, committees often create back-up plans in the event that any possible emergency or mishap occurs. Devise back-up plans and plans for back-up plans. Create checklists in advance of race day that cover in detail various event destinations that might include deliveries, course and parking marking, registration and welcoming, event timing, spotters and refreshment stations. As the director, be prepared to handle any number of situations that individuals involved with various aspects of the race may bring to your attention. Have a great race! Can I advertise on this site for our local mud run scheduled for this summer?